This is to inform that I will be away on holiday to Tokyo, from 29th December 2008 to 12th January 2009. What are some of the interesting and worth to note incidents in 2008? Death of a Singaporean in the terrorists attacks in Mumbai. To me, it has to be the escape of Mas Selamat followed by this. A woman PM is unlikely in Singapore, to me its the most assuming statement. YouthQuake 4 :) Because I'm one of the Speaker and I spoke for something that I had always been advocating for. What else but the reply on why PCF is allowed to cycle in public and WP is not. Oh!!! And not forgetting this too is infuriating!!!! The wake of the late Mr JBJ. US Presidential election, Barack Obama, the first black man, to have achieve this position. GST 8.5% for FREE transport, I wouldn't mind! In a dialogue session held with residents of Macpherson, a resident echoed his thoughts loudly by saying that he hoped that transport fares will not go up during difficult times as such. Mr Raymond Lim then explained that if we want free transport that would mean 8.5% in GST. First and foremost, the resident or as a matter of fact, we Singaporeans are not expecting FREE transport. So why the mention on FREE transport? "There are only two persons who pay when it comes to public transport fares. One, I use - I pay. Or two, I use - you help me subsidise my ride. What happens when you subsidise my rides? That means the taxpayers are now paying." What is so wrong to get the Government to subsidies rides? Especially for Senior Citizens. I overheard this from a coffeeshop talk... the Government wants us to work all of our lives to continue to contribute to our economy and society until the age of 65, or better still if you dont retire. Anyway there are 2 big corporations we can retire in that is Mac Donalds' and KFC. After having slog for so many years for the economy, when we are sick, poor and old, the Government should take care of us! I cannot help but agree with the uncle! He makes so much sense! On the other hand, if the subsidy is going to come from tax payers' money then what subsidy are we talking about here? A better word to use should be 'rebates'??? I'm sure there is more than 1 source of income for the subsidy. Does it have to come from the residents? SBS Transit made millions of dollars as profits. We have a basement fully choked with reserves.... can't we use it at least to provide FREE transport for Senior citizens? I am not asking FREE for all, its only for the Senior citizens who probably hardly gets out of the house! At least GST is already fixed with FREE transportation taken into account. Transport fares are not fixed and we are at the mercy of transport operators. Anytime they call for an increase, we got to pay extra. It is also subjected to external factors such as cost of oil. Therefore I am for GST at 8.5% with FREE transport for all Singaporeans! Last night I was helping out as a volunteer in the annual Hougang Christmas event. We were grateful for the help rendered by volunteers who managed game stalls, distribute goody bags and ice-cream. Props for the 5 games as well as choir for Christmas carol came from both Gordon's and Png's contact. Many more were there to make the event a successful one. Apart from children who came to enjoy themselves, another group who came in their uniforms were present to receive their bursary award from the MP of Hougang. The Hougang Constituency Education Trust was initiated by Mr Low Thia Khiang in Aug 1992. The Trust worked vigorously to raise funds through the auctioning of plaques during the Lunar Seventh Month commemoration festivities and temple functions. HGET has since, seen to the yearly awards of some 80 bursaries to needy students of Hougang Constituency from the Primary to the Tertiary levels. The MP would usually present the awards, during the Christmas Children’s Party held yearly in December by the Hougang Constituency Committee. Needless to say, application for this bursary is always over-whelming. Every Oct that is 2 months from the presentation of the awards, 2 groups of people will come together to assess these applications. They are the staff from Hougang Town Council and some members from the Workers' Party. Our objective is to give out as many as we can but because it is always a case of demand more than supply, we have to screen through every application with care. Applications that are somewhat doubtful will be kept aside for house visits. That's where we put our ground work to use :) For the past 2 years ever since I joined the Workers' Party, I had been involved in these house visits. Kenneth (my partner this year) and I were given a stack of about 14 applications to look into. Fortunately for us, these 14 household stays in the same cluster of flats hence it makes our job easier. From the experience I had last year, I know that we can make walking easier but there is no way to make the visiting easy. We must be ready to face the emotional challenge that awaits us as we visit each and everyone of them. I remembered this household vividly because it was just too difficult to forget. A little girl about age 7 years old opened the door for us. The house was nicely renovated with well-lit lights and fresh coat of paint. It was also very well kept and tidy. We asked for her mother and out came Mdm A (real name is not used in order to protect the identity of the children). It was the first time she had applied for this bursary despite having stayed in Hougang for at least 10 years. For the past 1 decade, she and her family was staying in a 4-room flat. Last year, they moved into this current 5-room flat. Everything looks and seems good, then why is she applying for the bursary? The more needy ones should be given priority. We need to probe tactfully to find out more. Before moving to this bigger flat, her husband owns 2 provision shop. Everything was taken care of by her husband and they had a steady stream of income. It was only after they moved into this bigger unit that the world collapsed on her. Her husband's business started to fall and was eventually closed down. To make things worse, he had actually had an affair with another woman for a few years. After the failure of his business, he went off with this other woman, leaving behind Mdm A and 3 beautiful daughters. The tears that Mdm A had been trying to hold back fell uncontrollably down her cheeks. Both Kenneth and I were extremely saddened by her plight. That's not all, suppliers and business associates whom her husband had dealt with before, came to her to ask for payment. It was evident from the splashes of paint found outside her unit that these creditors were pretty harsh on her. With no income and minimal savings, Mdm A had to rent a room out which can fetch her $400/ month. There is no way she can work because her children are too young, they need someone to take care of them. She had been relying on friends and volunteers for the past 1 year since her husband left. Mdm A had also approached her MP for help, she was given a probably solution which she is looking into. She didn't know about the eduction trust until a friend of hers who also stays in Hougang told her about it. Therefore, she decided to give it a try. I told her... not me ... it was the people who donated relentlessly that makes it possible. I was having lunch at Chevron House today, while waiting for my colleague to come back with his food, I overheard a conversation among 3 young executives with an average age of about 25. Their conversation was about the lifestyle of young people nowadays. Remember the article on Sunday Times that had featured Ms Agnes Lin??? Yup, these 3 young executives were talking about her. They were discussing among themselves how spoilt she was, etc. Having witnessed how our local press media failed to feature huge crowd at the alternative party's rally or rather chose not to, I had learned to only judge after finding out both sides of the story. 'The Online Citizen" did an excellent job in sort of clearing Ms Agnes Lin's name. "I'm sorry to have disturb your lunch, however sir, I would like to point out to you that this article that you had read might not be complete or what Agnes had said. 'The Online Citizen' did an interview with the ST reporter with regards to this and the reporter admitted that she had omitted certain information from that interview. Hence, the omitted information could have turned Ms Agnes Lin into Singapore's most detestable teen." The young man was very shocked at my abruptness, he then asked me what the hell is "The Online Citizen"? "Google for it... sorry but my point here is understand both sides of the coin before making any judgmental statements." At that instant, my colleague came back. I smiled at the 3 of them and went off to get my food. This incident once again confirmed my belief that ground work is essential. Besides reaching out to people who are not internet savvy, we also get to reach out to these groups of young individuals who probably thought that whatever they are exposed to everyday is right. We need to open up their minds to accept new ideas and voices. I did not regret the decision to go up and talk to this young man in fact I felt normal ...hahaha! I guess it must had been the amount of house visits and selling of 'Hammer' that had made me acquire thick-skin :) or probably my past profession. Whatever it is, I felt great that I had talked some sense into 3 young people today! With effect from 1 January 2009, more places in Singapore will be smoke-free. Any foodshop, except that the Director-General may designate for smoking, such part of the outdoor refreshment area of the food shop not exceeding 20% of the total floor area of that outdoor refreshment area. Any air-conditioned hall, ballroom or function room (including any such premises located in a hotel) during such time when it is used for holding a meeting, conference, seminar, course or an exhibition or for the purpose of serving meals. Any enclosed premises of a bank to which members of the public have access for the purpose of carrying out banking transactions. Any clinical laboratory, healthcare establishment, hospital, maternity home, medical clinic or nursing home. Any indoor ice-skating rink, roller-skating rink or roller-discotheque. Any indoor sports arena, bowling alley, billiard saloon, gymnasium or aerobic or fitness centre. Any public library or any library in any institution of higher learning. Any public museum or public art gallery. (ii) a pantry or other common area to which persons employed in such premises have access. (b) such part of any building which consists wholly or principally of office premises. Any enclosed or air-conditioned common area of any private residential premises or building. The Supreme Court, the Subordinate Courts and Small Claims Tribunals. (ii) a pantry or other common area to which persons employed in such terminal buildings have access. Any air-conditioned shopping mall or complex, including any shop, atrium, corridor, lobby, stairwell or other area within the shopping mall or complex, but excluding any place or premises used as a discotheque, pub, bar, lounge or night club. Any area occupied by a queue of 2 or more persons in a public place. Any air-conditioned restaurant, bowling alley, billiard saloon, arcade games room (including jackpot machine room), gymnasium, fitness centre, library, reading room, theatre or cinema in any private club. Any school, junior college, polytechnic or any training institute established under the Institute of Technical Education Act (Cap. 141A), including any area within its compound. Any enclosed or air-conditioned part of any building, hall of residence, canteen, lecture theatre, sports and recreation centre or stairwell in any university. Any public swimming pool, including any changing or shower room, or any area in the vicinity of such swimming pool which is likely to be frequented by any user of the swimming pool. Any washroom (including any mobile toilet), whether managed privately or otherwise, to which members of the public or a section of the public have or ordinarily would have access whether on payment of a fee or otherwise. Any sports stadium, including any facility, shop or common area within its compound. Any community building, community centre or community club belonging to or managed or maintained by the People’s Association, including any facility, shop or common area within its compound. Any bus interchange, bus terminus (except a bus terminus which is situated along the side of a road and does not provide for boarding of or alighting by passengers) or bus shelter, including any facility, shop or common area within its compound. (b) where the hawker centre does not have an outdoor refreshment area, such part of the indoor refreshment area of the hawker centre not exceeding 10% of the total indoor seating capacity. (b) any enclosed and independently ventilated room not exceeding 10% of the total indoor refreshment area of the discotheque, pub, bar, lounge or night club. Singapore worst hit but first to recover from recession? The TC should do something about this! This picture was taken in Tampines, Block 503. 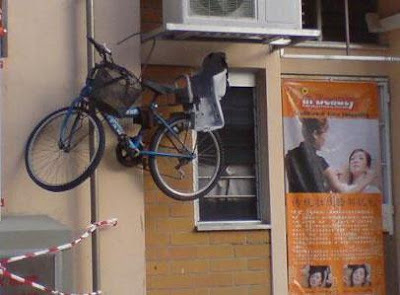 Instead of hanging wet laundry, this flat owner hangs his bicycle as well! Although its only level 2, it is still dangerous! Click here for a clearer picture. How's this for Singapore public transportation? Are we going to do away with buses and cabs? The recent report on reducing our electricity tariff is a classic example of why we need more than 1 political party system in Singapore. I'm not sure if its because of the recent letters that NCMP Sylvia Lim had sent into the forum on ways; how we can reduce the cost of electricity that had caused the authorities to re-look into their pricing system. However, it had certainly made them sit up and work for the betterment of Singaporeans.